First, The Rainier Valley Cooperative Preschool is holding a rummage sale from 11 a.m. until 1 p.m. at 1720 South Forest Street with lots of goodies to purchase from your neighbors. Then at 1, head over to Lewis Park for a “Thank You Beacon Hill” party from 1-5. You can chow down on delicious barbecued hot dogs, including vegetarian and vegan dogs. The good eats are sponsored by Hilltop Red Apple, Field Roast, and The Station. There will also be tours of the Lewis Park Natural Area offered hourly so Beacon Hill neighbors can see the progress that has been made in restoring the park. You can find the party at the Pavilion at Daejeon Park and the south end of Lewis Park, on the corner of 16th Avenue South and South Judkins Street. Finally, don’t forget the fundraising auction for the Denise Louie Education Center, from 1 p.m. to 10 p.m. at Tippe and Drague Alehouse at 3315 Beacon Avenue South. Rainier Valley Cooperative Preschool (which, despite the name, is on top of Beacon Hill) is hiring a replacement co-teacher. If this sounds like you, find more information and application instructions here. A table of baked goods for sale at the RVCP Fall Festival in 2009. Photo by Jason Simpson. 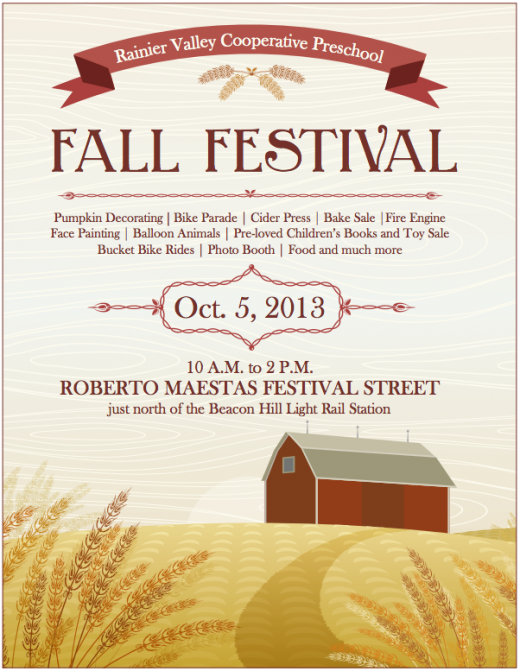 It’s fall festival season! The Rainier Valley Cooperative Preschool‘s annual Fall Festival is Saturday, October 13 from 10 a.m. until 1 p.m. on Roberto Maestas Festival Street in north Beacon Hill. The festival will have lots of activities, including bike hay rides, a bike parade, face painting, costume dress-up, a photo booth, cider pressing, pumpkin decorating, and more. All ages are welcome. There will also be food for sale including baked goods and grilled food for both carnivores and vegetarians. Proceeds from the festival will benefit the preschool. Click to see a larger copy of the event flyer. 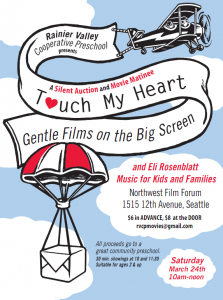 Rainier Valley Cooperative Preschool, located in the Beacon Hill Lutheran Church building on South Forest Street, is hosting a movie matinee, music party, and auction fundraiser on Saturday, March 24 from 10 a.m. until noon. The event will take place at the Northwest Film Forum on Capitol Hill (1515 12th Avenue). All proceeds go to support this community preschool. The day will include two showings of Touch My Heart: Gentle Films on the Big Screen, a collection of film shorts from this year’s Children’s Film Festival, live music by Eli Rosenblatt, and a silent auction. Highlights of the auction will include desserts of the month, a handmade quilt, single-malt scotch whiskey tasting, landscape architectural consultation, bike tuneups, a watercolor and ink portrait commission of your child, a birthday party for 15 at Southgate Roller Rink, gift cards to local businesses, and a guided mushroom identification walk. Tickets are $6 in advance, and $8 at the door. You can buy tickets for a 10:00 a.m. movie showing with the auction afterward, or for the 10:30 auction with a movie showing afterward at 11:30. The auction will run from 10:30-11:15. Please bring cash or checks for your tickets, concessions, and the silent auction. For information about tickets, contact: rvcpmovies@gmail.com. 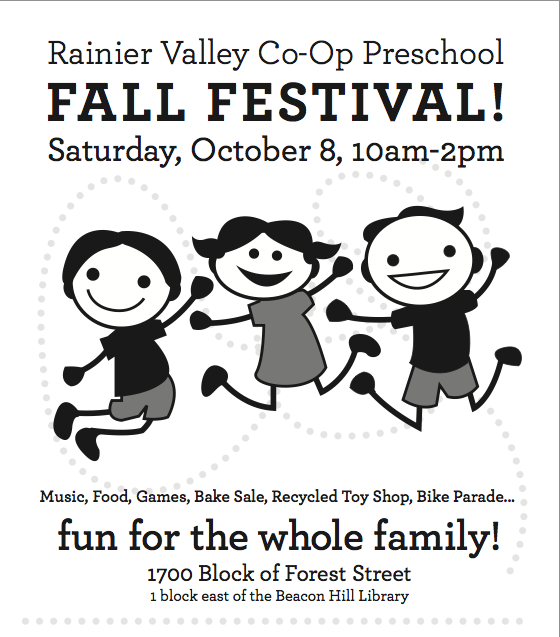 As we mentioned a couple of weeks ago, The Rainier Valley Co-Op Preschool is holding their annual Fall Festival this Saturday, October 8, from 10 a.m. to 2 p.m. The festival will be held in the 1700 block of Forest Street, in front of Beacon Lutheran Church. The family event will include a block party, a dj dance party, live music by Eli Rosenblatt, bike parades on the hour, hot dogs, a bake sale, games for kids, a recycled toy shop, a treasure hunt in the sandbox, face painting, and more! Neighbors of all ages are welcome to have fun and help support the preschool. Bring your bicycle if you want to be part of the bike parades. 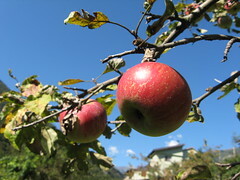 Neighbors are invited to help with the apple harvest from Dr. Jose Rizal Park. Photo by Alessio Maffeis via Creative Commons. Please come down to harvest the second crop of apples (tiny, tiny one last year, this year is much bigger); these apples are destined for the City Fruit apple press at the Oct. 22 Beacon Hill Harvest Festival, but there should be enough for your baking needs. Now, these apples may have some bugs, but last year the winesaps I picked were still good for a significant pie. We’ll have three fruit basket pickers (whatever they’re really called), plus some orchard ladders. We’ll also have all the containers necessary to hold the apples and transport them over to the Garden House, where the cider destined will cool in the basement until the Harvest Festival. Forecast says it should be pretty nice in the late morning, too! So please take a wee bit to pick some fruit and, also, to check out the park. It’s really pretty magnificent now, and it will only get better! 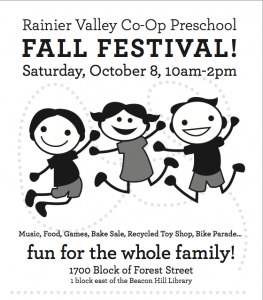 The Rainier Valley Co-Op Preschool (which, despite the name, is not in the Valley at all, but up on top of Beacon Hill) is holding their annual Fall Festival on Saturday, October 8, from 10 a.m. to 2 p.m. The festival will be held in the 1700 block of Forest Street, in front of Beacon Lutheran Church. Apologies to everyone. We are way behind on posts this week. Here’s a catch-up edition of Beacon Bits to fill you in on the latest. Notice the newspaper up in the windows of the old Beacon Pub? According to the Bar del Corso blog, they have started work on the building, where their pizzeria will be opening later this year. Just south of the former pub, another change is about to take place: ROCKiT space is moving. Betty Jean Williamson reports that ROCKiT will continue regular hours of operation at the current location, 3315 Beacon Avenue South, through January 31. After that, Open Mic moves to Kusina Filipina (3201 Beacon Avenue South) on Saturday, February 5. The event starts at 8:00 pm and costs $5. Tots Jam is moving to El Centro de la Raza room 310 (2524 16th Avenue South) on February 2 at 9:00 am. Classes are $7. In the meantime, the ROCKiTeers have a lot of work ahead before vacating the building at 3315 Beacon and moving their activities into other locations. It sounds like they will need some volunteer help, including cleaning, repair, and moving. Contact Betty Jean at 206-658-0187 or bjwlmp@msn.com if you can help. There will be a ROCKiT space moving sale on January 29 from 9:00 am – 6:00 pm. If you have loaned ROCKiT anything, please pick it up soon or let them know if you want to donate to the sale. Travis Mayfield at KOMO points out that Edwin Lee, the new mayor of San Francisco and the first Asian-American mayor of that city, was born on Beacon Hill! The SPD reminds you that City employees will have laminated picture ID that includes a name, department, and serial number. If you see a suspicious person come to your house, and that person can’t produce a City of Seattle picture ID, call 911 to report the situation immediately. The Nova High School Book Night is coming on January 26. We are told it’s a “book fair/book exchange with books of all kinds, free for all!” Beacon Hill neighbor Levecke Mas is collecting books for the the book exchange; contact Levecke at leveckeinseattle@gmail.com. You can also drop off your book donations at the Nova office, in the Meany school building on East Capitol Hill (300 20th Avenue East). The event is from 6:30-8:30 pm on Wednesday, January 26, and it is open to all. Learn more about Nova and the Book Night at http://novaproject.my-pta.org. Rainier Valley Cooperative Preschool invites the community to learn about the school at an open house on Saturday, February 5, from 10:00 am to 11:00 am, and Thursday, February 10, from 6:00 pm to 8:00 pm. The parent-run preschool is located in Beacon Hill Lutheran Church at 1720 South Forest Street. More info at their website. While it’s not Beacon Hill-specific, I can’t resist posting this link to a photo of former City Councilmember Peter Steinbrueck with a man in a heron costume. Thank you, Seattle Municipal Archives. This pothole was found somewhere on Beacon Hill by photographer sodoheights, who added it to the Beacon Hill Blog photo pool on Flickr. Thanks! The “Bumper to Bumper” column in the Seattle Times addressed a much-discussed Beacon Hill topic this week: Beacon Avenue’s bumpy pavement outside of the light rail station. According to a spokesman for Sound Transit quoted in the column, we should be seeing some relief for the the poor pavement when that segment of Beacon is repaved in the next couple of months. Some Beaconians might be curious about what happened to former Culinary Communion operator Gabriel Claycamp and his pork emporium, The Swinery, after Claycamp decamped from Beacon Hill back to West Seattle last year. It turns out the road has not been entirely smooth (some of the comments on that post are interesting, to say the least), but Claycamp and the Swinery did get a positive write-up from the New York Times’ T Magazine Blog recently. Have you been one of the lucky attendees of El Centro de la Raza’s tamale classes? Chances are, you haven’t – they have been wildly popular and have been selling out quick! Here’s a link to sign up for the next one, on May 15th (they are every 3rd Saturday, by the way). Our April class is this Saturday, so that means that even though you might not be able to learn how to make them yourself, this month, you can still purchase some! Tamales are $12/dozen and you must order by Wednesday at 5pm. To order, call Ashley Haugen at 206-957-4611 or e-mail development@elcentrodelaraza.org. The Dana Lupinacci Band is playing blues and jazz on Thursday night at the Beacon Pub, 3057 Beacon Avenue South. Show is at 8:00, and there is no cover charge. Also in musical news on the Hill: We neglected to mention that Beacon Hill’s own Blue Scholars were featured in The Stranger a couple of weeks ago. Some lowlife stole a couple of kids’ bikes right off their front porch. “1 royal blue/silver/black 20″ mongoose, BMX style with pegs. Right handbrake is cracked. 1 lime green/silver 20″ Next, BMX style with pegs.” If you’ve seen them, please contact the parents. Denise Louie Education Center is holding their Fifth Annual Children and Families Festival on Saturday, May 22 from 1:00 – 4:00 pm at their Beacon Hill location, 3327 Beacon Avenue South. The event is free and open to the public, and will feature food, music, crafts, and community resources. Volunteers are needed. For more information or if you are interested in volunteering, please contact Frances Lin at 206-792-9771 or email flin@deniselouie.org. The Rainier Valley Cooperative Preschool is hosting a rummage sale this Saturday, April 24. The school is located at the Beacon Lutheran Church, 1720 South Forest Street (just across Beacon from the library). School levy ballots should be reaching mailboxes throughout the city this week for an election officially ending on Tuesday, February 9. Two levies are on the ballot this time, a capital levy (Proposition 1) to replace the expiring Buildings, Technology and Academics levy approved by voters in 2004, and an operations levy (Proposition 2) which replaces the expiring three-year levy that voters approved in 2007 and have supported every three years since 1976. Among other things, the capital levy includes funds for ADA/life safety systems installment at Mercer Middle School, along with renovations districtwide. 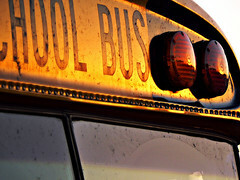 Beacon Hill schools would also see funds for academic improvement, including Early Learning classrooms at Kimball and the Science, Technology, Engineering and Math (STEM) option program at Cleveland, and funds for improving athletic fields and making their lighting more energy-efficient. You can read more about the levies or watch an informational video by Superintendent Maria Goodloe-Johnson at the SPS website. It’s open house season at local schools. We posted about a few recently. Rainier Valley Cooperative Preschool is also holding an open house on Thursday, January 28 from 6:00 pm – 8:00 pm at the preschool’s home, Beacon Lutheran Church, 1720 South Forest Street (across Beacon from the library). They say, “Come meet our families and learn about our preschool: We encourage the whole family to come to the open house and check out the space and meet the teachers and community.” For more information, email rvcpinfo@yahoo.com or call 206-723-3115.